Virechana is one of the five procedures of Panchakarma (see Panchakarma) which is specified for Pitta issues. 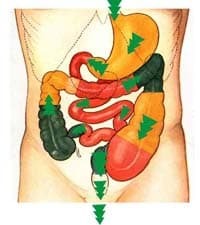 This is a controlled process that gathers ama (toxins) from many Pitta locations in the body, concentrates it in the small intestine and then discharges it. It purifies Pitta function and strengthens all metabolic processes. Virechana therapy is good for all types of Pitta related disorders such as hyperacidity, colitis, acid peptic disease, hemorrhoids, chronic headaches, migraine, malabsorption, some types of diabetes, allergies and skin diseases (acne, dermatitis, psoriasis, eczema, leprosy, and leucoderma). Two and a half hours before Verechana the patient receives Pitta enhancing food with hot spicy and sour qualities and rests until the food reach the small intestine. The classic Ayurveda text Charaka Samhita lists 315 herbal preparations which can be used for Virechana. It is the responsibility of the trained Ayurvedic physician to select a purgative that is appropriate for each patient. Several hours after taking the purgative, the patient usually feels the need to move his bowels. Over the next hour one may have from four to ten bowel movements. The response depends on the constitution and the amount of ama (toxins). After all the toxins have been expelled from the small intestine, the urge to evacuate naturally subsides. After Virechana the patient is advised to rest, stay warm and relaxed, and keep away from cold drinks and cold baths. It is vital to follow a special diet for several days after treatment to rekindle the agni (digestive fire). After successful Virechana the patient feels clean, light, and strong. Digestion, assimilation and appetite are normalized, the mind clears and the intellect sharpens. The symptoms of Pitta disorders, such as skin inflammations disappear. Virechana as part of Panchakarma is a special, powerful procedure requiring guidance from a properly trained medical staff. It is performed individually for each person with his or her constitution and medical condition in mind and requires close observation at every stage. I wouldn’t go to someone with a modest amount of Ayurvedic training for this procedure. Talk to the doctors and patients and look at reviews and recommendations. I am currently suffering from chronic allergy since past 3 years. I have to take Cetrizine every 3 days. Now i had been diagnosed with Allergy to food (milk, ground nut, almond, Chana dal, cheeze, tamato, cucumber, bread like items) and Inhalants (house dust, mites, paper dust). With IGE level 10 times higher than normal range. i already been completed naturopathy treatment. and now with treatment and avoiding allergic food. it is in control 80%. I want to completely cure this allergy as it is not by born. Can you guide me what therapy is useful to me. I dont have digestive problem. or no cough. no constipation. I am 35 years old. No other illness. This article is for general information only. It is always a good idea to see a doctor in person. I too had dust mites allergy and took cetrizine, but, never liked the drowsiness it used to cause. Luckily I was advised to undergo virechana treatment. It has been 4 years and never got the allergies again. I just underwent another treatment just to maintain good health. Good luck to you. hope this helps. Any recipe to prepare a purgation drink at home? It is the responsibility of the trained Ayurvedic physician to select a purgative that is appropriate for each patient. All glories to my teacher.